Point Line Flow: Open-source in visual arts. An outline for a historical perspective 1910-2000. Open-source in visual arts. An outline for a historical perspective 1910-2000. How many times have we wondered in front of a finished work about where from the artist started, how he proceeded and why. All those decisions that make up the work process get lost generally in the final product. But is it really that way? The idea of open-source has been around for quite some time in the Internet circles, so everyone are familiar with it in one or another way. What is curious is that the idea of opening the productive process has been one of the fils rouge in visual arts over the previous century. But, first of all, what could the code be in visual arts? I would preliminary term it as both the process of production or of fabrication of the work, as well as the conceptual process of idea-making. I will attempt a very rough history of open-code in visual arts in the last century, which hopefully could be useful for discussions in other disciplines, too. So, what have artIsts been doing with their codes over the course of the previous century? 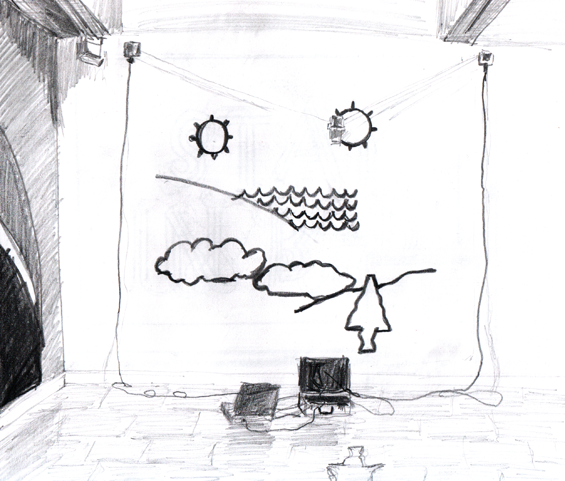 Drawing based on Jürg Lehni's Hektor Draws a Landscape, Hektor Sings a Song. Broadly speaking, visual arts have struggled for centuries to create an aura of mysticism and secrecy around them, because on exactly this imagery depended the social position of the artists, their social recognition and financial status. This mystification involved the guarding of knowledge both technical and conceptual. However, in the 20-the century quite a few authors worked in the opposite direction, revealing rather than concealing. As a matter of fact, visual arts can be considered in many ways as precursors of open-source. But, the fact that they have not come up with the concept explicitly is paradigmatic and tells us many things about the underpinning organisation of labour in visual arts. The idea to open up the productive process and thinking process at the same time may be born around 1910. Duchamp's “ready-made” is a captivating case. At first, it seems to elevate an artist to a godlike creature with a power to pick any quotidian object and imbue it with esoteric meaning. On the other hand, to be recognised is the possibility that “ready-made” was an invitation of sorts to everyone. Fundamentally, a person has to find an object and give it an inscription. Of course, the second part demands some conceptual and/or poetic skills predisposition, but the fact is that an object could be just about anything that a person “encounters”. Dadaists and Surrealists pushed the idea a bit further with their poems written by cutting out words from newspapers, mixing them and then casually picking them and writing them in sequence. They even provided instructions for the public how to make their own poems. In the 1920s was quite popular the idea, to my knowing originated in the URSS, that all members of the society should express themselves. But what remains is a question of means of production, which were considered a prerogative of bourgeoisie. Benjamin in his ground-breaking Author as Producer approaches the question head-on. He argues that visual artists, such as photographers, and he speaks of musicians, too, should engage in literarisation of their work. For example, Benjamin invites photographers to write meaningful captions as he considers writing the only true means of political emancipation of arts. A more practical approach to the matter was done by Wassily Kandinsky. In his treatises Concerning the Spiritual in Art (1911) and Point and Line to Plane (1926) he gives us a vast number of formal indications for on composition, colour and, generally, on all the aspects of visual language. The second title is a true do-it-yourself textbook for modernist abstract art. Kandinsky's unique clarity of exposition makes it a reading easily approachable to anyone, from high-school adolescents to professional architects. These manuals continue since a long time broken tradition of art manuals, which were quite in vogue in Italy in the 15th century. In the postwar years, in the United States, an important stream of open-source begins to shape up. At first glance, the ideology of “genius”, that ever fashionable term in the realm of arts, was being practised in the “epic” painting of the New York School. Imaging, but not really knowing, how Rothko or Ad Reinhardt meticulously layered their canvases was an essential part of the subsequent observation of their art pieces. At the same time, and right in the same milieu, something extraordinary happened. The archetype of an artist-hero, Jackson Pollock, accepts to be filmed as he paints. This event takes place in 1951 at his property on Staten Island, and the video is directed by Hans Namuth. The video is a staple in the history of art. Not only we see Pollock at work, but we see detailed instructions as to how he works, said in his own words. It can be objected that he does not discuss what is “underneath” the surface, the real coding of the work, but probably that was not one of his main concerns. What makes the video so significant is the second part where the process is seen through a glass upon which Pollock works. Nowadays, more than 60 years later, the effect is still enthralling, not so much due to the ingenuity of the camera positioning and the intensity of Pollock's “action”, but for the fact that we are “inside” the work, we are within it. The mere complexity of Pollock's works, when observed in the museum, simply does not allow this kind of insight. For that very reason, this video is so precious. This type of operation, a documentary about an artist at work, becomes mainstream with Henri-George Clouzot's Mystery of Picasso. The title suggests the aura which circled around the most primitive of modernist artists. Clouzot brings Namuth's approach to an entirely new level in terms of spectacle, thanks to the dramatic use of lightning and directing. Moreover, a sensational touch is the filming of paintings in a sort of animation. We see them unfurling step-by-step. We can almost see Picasso's mind at work, but not his hand. 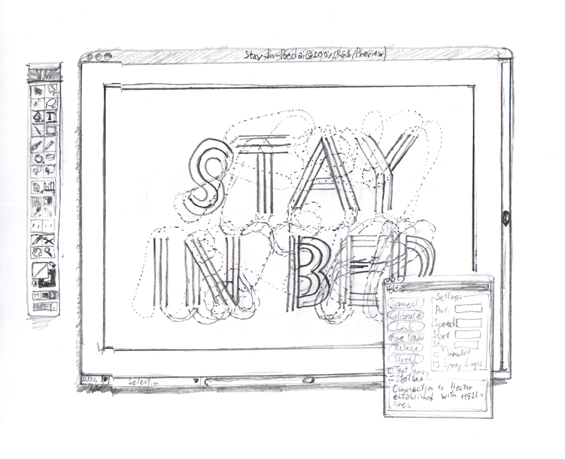 Drawing based on Jürg Lehni's Stay in Bed project for Hektor. In the same years in Paris were operative the Situationists. Their contribution to the open-source is difficult to underestimate. Despite their magniloquent anarchic language style they liked to adopt, the fact is that they provided very simple and significant guidelines on how to effectively practice dérive and detournement. After reading Theory of Dérive the reader can feel fully prepared to go out and actually perform one. The Situationists, in fact, were not intending to create a piece of art, they invented practices, which meant that they asked for others to deploy them. In this example,“open-source” is closely linked with political action, as these urban walks were considered as instruments for emancipation. In 1968, Robert Smithson explains in detail what he understands with the concept of “Non-Sites”. His writings are part of a vaster stream of theoretical considerations which become a distinctive trait of conceptual art. Not all of them were at all useful to understand art, the best example being the absurdly incomprehensible Joseph Kosuth's “Art after Philosophy” (1969). Other American artists were somewhat more pragmatic. Donald Judd, even if his sculptures may transmit opaqueness, left a considerable amount of writings from which the tenets of his work can be derived. Some performance artists have also given great attention to the exposition of the program or the code of the piece. In many cases, the code is the only trace of the work that remains. Excellent examples is given by the way in which Richard Long presented his long walks through natural environments. Sometimes he provided a map of the walk with annotations. Sometimes the only remnants were the written text stating the place which he visited etc. Often he employed photography as the document of his passage. But, mainly, the information Long gives out on his experience seems ready for use to re-enact the experience. For example, Long's straight line walks are most feasible. Simply pick up a straight path, a mile long, preferably somewhere on a grassy terrain, and walk up and down for days or months. The result is the trace left on the ground. Similarly, many Marina Abramović's performances are open-coded experiences. There is no grand mystification about them. What is unknown is how exactly she felt during the performances. There is no way to find out if not by trying to actually re-enact some of them. One of the more stunning bodies of “open-source” in arts has been produced in the area of the so-called “analytical painting”. This tendency spread out throughout Europe in the 1970's, from France's Support+Surface group to Italy, Germany, Belgium, and so on and might be imagined of as a European variant of minimalism, not as much for the look but for the attention given to the process and materials. The peculiarity of these artists is their disposition and proneness to expose in greatest detail their work processes. I will give only an illustrative example, found in Enzo Cacciola's “Analysis and experimentation in work” written in December 1975.
d) pouring of water on surface and on sides. 2. natural settling-down of concrete during the drying time. Final operation after 48 hours of drying. e) spreading gelatin on concrete, it tends to rebuild the dimensional concept of surface of the work. 3. analysis of the materials and of the proceedings through an emotional filter, which involves proportionally and indissolubly in a single unifying process creativity and operation, where the result exclusively finalises the concept. Apart from these detailed texts, Cacciola made sequence of photos which illustrated every single step. In a very similar way, in 1989 Rudolf Stingel's Instructions exposes the complete know how on the creation of a painting. Significantly, he even invited the public to interact with the painting. From the above cited examples, and there could be dozens of others, it is obvious that in the period 1950 – 1980 it was quite natural to share not only the results, but also the artistic process. Writing about the process became quite a standard in that period. This is what Benjamin's “literalisation” could have meant. Somehow this important trend declined during the last two decades of the previous century. There may be a series economic, political and social reasons, as well as those of purely artistic nature, but I would not tempt this kind of analysis. At a general overview, the art of the period seems to be more closed on itself. On one side, it became more complex as to its hyper-textuality. Only the most expert viewers could manage to discern where from single elements were “cited”, and it became a subtle play between the artist and the public, who would outwit whom. In this way artists put themselves in the power position, demanding a considerable effort on behalf of a spectator. Let's instead think of the enigma of enigmas, produced by the video art shaman of the late 20-th century. Matthew Barney's Cremaster is without doubt one of the most compelling contemporary art works, both visually and narratively. The sheer complexity of visual impulses and the meshing of its narrative easily induces illegibility. Eventually, the artist provided a most detailed account on all the five movies of the series on the Cremaster's web site. On the other hand, from the 1980's on, the productive process very often becomes crucial for the work. The use of hi-tech, new technologies of fabrication, new formulas, made the secrets of laboratory work a prerogative for many artists. An interesting figure, at the passage from the transparency of 1970's analytical painters onto more tech-oriented closed practices of the 1990's is Peter Halley. He has steadily written about his conceptual grounding, that is, what abstraction should be at the moment. At the same time, he has never spoken of the productive process in itself, which in his case could be of great interest because of his unique use of Day Glo paints and textured materials. The technique becomes a truly industrial secret anew, as in remote times when oil paint was discovered. But, probably the chief reason for the return on enclosure of artistic codes is the restructuring the art market has experienced since the 1980's. Contemporary art simply became a huge business industry as never before, so the questions of copyright became crucial. Everyone should guard their own secrets. There are some glaring exception, though. Damien Hirst in his series of Dot paintings reveals perfectly how they are made. The canvas is covered by dots of the same size disposed in an invisible grid. The only other rule is the fact that a tint should not be repeated twice on the same canvas. This most simple programming produced more than a thousand variations, as we could see in his recent global show. Moreover, in his autobiography, or rather a series of interviews, On the Way to Work, Hirst ironically, but simply, explains the codings behind some of his most famous works. Santiago Sierra puts in danger the inner workings of the art system by exposing the financial side of his performances or installations. He says how much and how he has paid his performers to do very often some outrageous and humiliating activities. Even if operating firmly within the art system, his method could be efficiently adopted, transformed and applied to other situations. 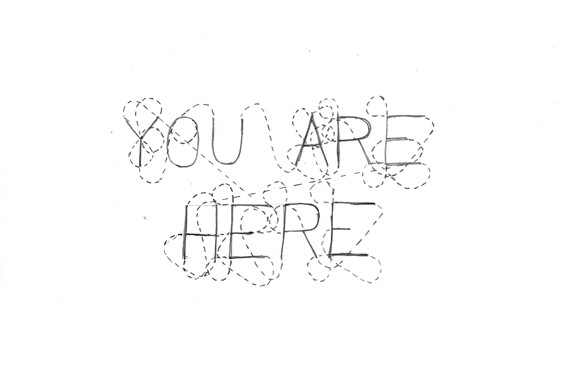 Drawing based on Jürg Lehni's You Are Here project for Hektor. But, why, after dozens of artists have exposed their productive and even conceptual processes, the art of the period is still considered to be so opaque? Maybe because artists, curators and other art operators have never really dedicated too much attention to the communication of their codes, or they did not do it in the most efficient manner. Artists' writings were often published in very limited series, and were not shown at all during the exhibitions etc. Nowadays, there is almost not any artist's web site without a so-called “artist statement”. Naturally the quality of writing varies greatly, and many of them are not helpful at all. But, the fact is that they are quintessential for the open-sourcing the visual arts. In that sense, art schools have tried in the last 20 years to interpret art as knowledge. Many “art as production of knowledge” courses have been opened. Some of them require artists to be able to conceptualise their work along with doing it. Even though theoretical considerations on this matter are often pure academy and lead to a further mystification of the discipline, there are some instances that lead the other way. If art is knowledge, then it should be communicable and shareable. The answer to this in the 1990's was the emergence of participatory practices, what Nicolas Bourriaud termed as “relational art”. Their main objective is to open the field for interaction between artists and observers by rendering them participants. The main challenge for these artists was how to supersede the top-down role of the artist. Bourriaud eventually adopts the language of the Internet. The concepts of user-friendliness, interactivity and do-it-yourself are both methods and aims of these artists. As such, they have opened, and they have connected closely with the next generation operating in the 2000s on intersection between new media and social action. This will be the topic of a future post. Finally, to be reevaluated and reconsidered is a distinctive 20-th century exclamation, the famous “I could make that!” expression in front of some art pieces. That is why, for example, Lucio Fontana's spatial concepts are breath-taking even today. It is a simple gesture, an invitation even. This is what Raoul Vaneigem thought about when he spoke about the notion of diffused creativity. It was near also to what the most prestigious of the previous century artists-educators referred to. Joseph Beuys firmly believed that “every human being is an artist”.